The Torrey LEQ-5/10 provides economical alternatives to handle your portion weighing needs in a wide range of manufacturing and food service applications. Ideal for restaurants, bars, pizzerias, bakeries, industrial kitchens, hospitals and more! The LEQ-5/10 is NTEP approved, Class III, CC# 10-044. The LEQ-5/10 features a progressive tare to obtain net weight, while automatically subtracting the container`s weight for precision measurement. Built to last, our scale features an AC adapter and built-in rechargeable battery with an auto power-off function to save power. The stainless steel cabinet and plate are designed to handle the rough handling of everyday use. The LEQ-5/10 has a capacity of 10 lbs x .002 lbs, This gives the scale the precision you need to help maximize your profits. With a footprint of only 7.8" x 9.6", this powerful scale meets the needs of your business while requiring minimal space. 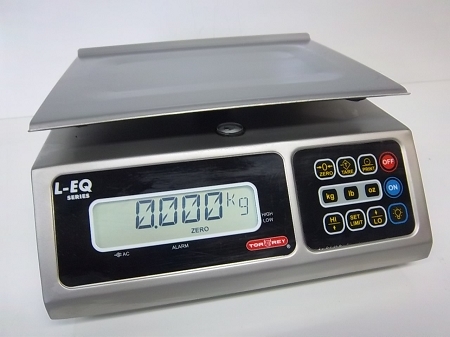 The LEQ series scales also feature an easy to read display (with a built-in serial port for easy PC/printer communication) and easily toggle between kg/oz/lb. Offering a programmable audible alarm for pre-packing operations, the LEQ-5/10 and LEQ-10/20 are attractively designed and tough enough for everyday professional use. Whatever your portioning control needs, the LEQ-5/10 or LEQ-10/20 scales from Tor Rey will meet the needs of your business.